Makar Leads Award Honorees - College Hockey, Inc.
Hobey Baker Award winner is the first from UMass. Cale Makar enters the NCAA championship game one point off the national scoring lead (Photo by Matt Dewkett). 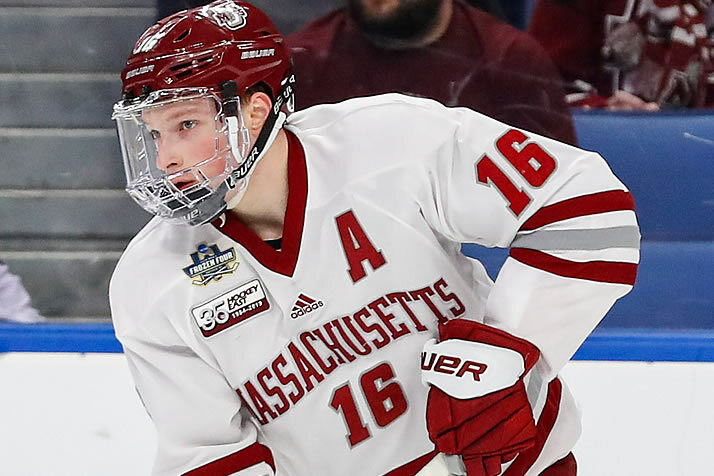 On the eve of the national championship game, Massachusetts sophomore defenseman Cale Makar captured the 2019 Hobey Baker Award as the top player this year in college hockey. Makar enters the national championship game with 49 points, one shy of the national scoring lead. He beat out two other defensemen, Harvard’s Adam Fox and St. Cloud State’s Jimmy Schuldt, who were the other members of the Hobey Hat Trick. The Calgary native was also named a first-team All-American along with teammate Mitchell Chaffee. St. Cloud State led all schools with four All-America selections. Wisconsin’s Jake Bunz claimed the Hockey Humanitarian Award as “college hockey’s finest citizen.” After a mission trip to benefit an orphanage in Haiti, Bunz became actively involved in the development of the Fond Blanc Foundation to further assist the orphanage.